Michael J. Jackson rarely spoke about his 34 years as a military pilot, let alone his reputation as a World War II ace. His two surviving children, Carol Schmitt and Elliott Jackson, are only now fathoming their father's greatness. "I'm so proud of him," says Schmitt, of Marlton. "He's a hero. We always thought of him as our dad, but after getting all these letters asking for his autograph, we realize he was really a war hero. And we miss him." Michael Jackson retired as a one-star Air Force General and was buried with full military honors Friday at Arlington National Cemetery in Arlington, Virginia. He was 89. Jackson's signature red-nosed, yellow-tailed P-47 Thunderbolt plane was dubbed "Teddy," his late wife Eleanor's nickname. But the quaint moniker hardly reflected his disposition in the cockpit. While flying 340 hours of combat during 86 missions with the Army Air Corps (later the Air Force), Jackson was credited with destroying 14 enemy aircraft and damaging seven. He instructed West Point cadets in basic, advanced and combat flying techniques and later went on to fly with seven of the top 10 aces in World War II's European Theater. Jackson's two children have gotten a glimpse of the storied life the Marlton resident led by reading passages in books about war heroes and yellowing newspaper clippings highlighting his wartime heroics. Schmitt keeps her father's bedroom exactly as it was when he was alive, a private tribute to the brigadier general. His original leather helmet and flight jacket are on display there. Hanging on the walls are two plaques honoring Jackson's induction into the National Aviation Hall of Fame in Dayton, Ohio, and the New Jersey Aviation Hall of Fame and Museum at Teterboro Airport. There are certificates of achievement amid renderings of fighter planes and portraits of a youthful Michael Jackson suited up in military gear. His numerous military medals are encased in glass. 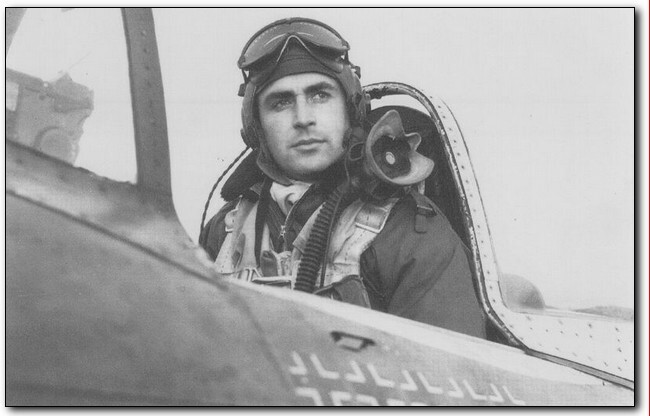 He was awarded the Distinguished Flying Cross and the Silver Star for gallantry in the face of an enemy. Elliott Jackson says his father earned a Purple Heart after an anti-aircraft shell passed through the bottom of his plane and shattered the canopy, leaving him wounded. But it's the frequency of the letters addressed to her father, two or three a month, that Schmitt finds "amazing." The envelopes contain the modest requests of war buffs and historians seeking Jackson's autograph, a handwritten letter or other keepsake. And they come from all over the country and from England, where Jackson was once stationed. Schmitt's fiance, Roger Horneff, recalls a story Jackson told him in a rare moment when he spoke about his wartime feats. Jackson surprised colleagues on his first combat-flying mission when he outmaneuvered an enemy Nazi plane that had gotten the jump on him. Jackson -- then in his early 20s -- maintained his composure, and despite being weighed down by two 500-pound bombs attached to his plane, worked his way behind the enemy aircraft. He shot it down and then proceeded to drop the bombs on his target, a railroad junction. "They thought he was like all the other new kids who come in," Horneff said. "After that, they decided he wasn't the new kid anymore." On another mission, Jackson -- wingman for an ace pilot -- ordered a strike on 10 enemy planes that were gunned down as they were landing. In yet another instance, he and his comrades took advantage of the glaring sun to sneak up on eight enemy planes, destroying all in one swoop. But the heroic pilot wasn't all work and no play. Jackson and another pilot once flew from England to France to pick up a load of what was supposed to be coal, according to the paperwork. In actuality, it was a shipment of champagne, which they illegally transported across the country's border. "He was brilliant," Horneff said. "He was an exceptionally good communicator. He didn't have a vast vocabulary. All the words that he selected were the right ones to speak. He understood things that other people didn't even know existed." Jackson's children describe their father as a generous soul and a real handyman whose hobbies included building houses, flying Cessna single-engine planes and golfing. "He was a big do-it-yourselfer," said Elliott Jackson, of Marlton. "If there was a way he could do it himself, he would. He was not one to sit still. "He was always a take-charge kind of guy."